Whether you call it a closed faced reel or a spincast reel makes no difference. Investing in a high quality spincast reel can be a difficult decision. Do I want to go for quality or price? Well, now thanks to the free market economy you don’t have to make that decision. Whether you are a professional angler teaching other’s the wonderful art of fishing for the first time, or a casual user, we are certain that one of these spincast reels will suit your needs. The market has thousands of reels to choose from. That’s why we took the time to compile our list of the best spincast reels of 2017 – 2018, to make sure you have as much information as possible. Our list will help you choose the right fishing reel for you. Since day one, Zebco has been known to make the best entry level fishing reels in the business. The model ZO3PRO is the best push button fishing reel for the money on the market today. 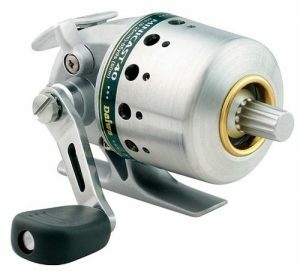 Known for their model’s 33, and 202, the Omega Spincast Reel blows the other’s out of the water when comparing it’s list of unique features. It is the first reel on the market to feature a unique seven-bearing retrieval system. It also comes equipped with a ergonomic design that can be inter-changed to work for a left or right-handed retrieval. It also comes with aircraft-grade aluminum coverings, a triple cam multi disk drag system, but the best part of all it’s the one-year manufacturer’s warranty. It’s like Zebco is taking all challengers begging you to try and destroy this reel. All gears are made of quality metal, not plastic like so many of Zebco’s competitors. With it’s fast retrieval timing, easy set and forget drag system you’ll be reeling in all kinds of fish in no time. It works great with rods, large or small but you typically want to place it on a 6′ – 7′ casting rod. 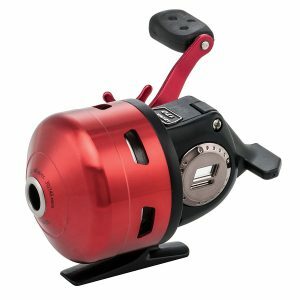 If you are in the market for a spin cast fishing reel, then this is what you have been looking for. Efficient, durable and accurate without breaking the bank. Without a doubt, the best spincast fishing reel for bass fishing on our list is the Zebco Omega ZO3PRO Spincast Fishing Reel. What size fishing line works best? You can use 2lb to 30lb test without issue. However, we recommend somewhere in the middle for optimal performance. What about using this reel with power pro fishing line? It can be used just fine with braided line. Some consumers are reporting that it worked great with 6lb braided fishing line. How much does the reel weight? 1.3lbs is the reel weight. Can you use the Zebco Omega ZO3PRO in saltwater? While it is primarily a freshwater reel, with proper maintenance and cleaning after every use in saltwater it will work. What is the gear ratio for the Zebco Omega ZO3PRO? 3.4:1 is the gear ratio for this reel. Is this about the size of the classic Zebco 33? Yes! They are about the same size. Any problems with a slip knot for a slip bobber catching or casting inside this reel? No! A slip knot works fine for this reel and doesn’t get caught inside. 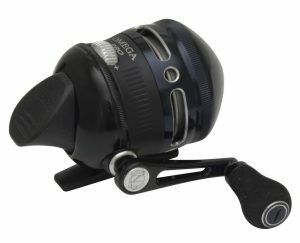 Is the Omega Pro 3 a larger size reel than the Omega Pro 2? Yes! The 2 is the ultra-light model. The Omega Pro 3 is on our list because of it’s all around versatility. Will this reel hold up when targeting larger species like carp or striped bass? Yes! Many consumers are reporting that they’ve caught striped bass and largemouth bass with the factory line and reel. Since 1955 Daiwa has been setting the gold standard in innovative fishing tackle. Daiwa’s fishing reels are considered to be among the best in the world, hence the reason why they made this list. Customers that have used this product recommend a 6lb fishing line diameter. Using braided fishing line with the Daiwa Goldcast can be done and is recommended if you plan on fishing for larger species. However, if your targeting larger species, you can pick between three models in the Daiwa Goldcast series, allowing you far more flexibility is the GC100 and GC120, with a much larger recommend fishing line diameter. This fishing reel is unique in the fact it offers a ball bearing drive, and a metal cone. Most spincast fishing reels have plastic cones, metal is far more durable and lasts a lot longer. With anti-rust resistant paint, and an optimized line aperture it’ll cast farther and last longer than anything else on the market today. As the old saying goes, you get what you pay for. The best all around Spincast Fishing Reel is the Daiwa DC100 Goldcast. You can control the distance of your cast by placing the handle in the osicillation position, where the spool gets more exposure. However, I’ve found that controlling the distance you cast can be done easier by double tapping the push, or pinching the line with the opposite arm holding the rod works best. This reel also comes pre-spooled with premium fishing line, so your ready to go once it arrives in the mail! All factors considered, this spin cast reel is one of the best on the market. Can you use braided line with the Daiwa Goldcast? Yes! It’s also been reported to work well with up to 30lb spider wire. However, if you’re going to use braided fishing line with this reel, try and keep it between 10-15lb. Is the handle reversible for left or right-handed fishermen? Yes! You can switch from left to right handed. Can you fish in salt water with this reel? Or is it best to keep it in fresh water? Yes! But make sure to keep your reel oiled, and wash it every time when exiting salt water systems. What pound test line does this reel come pre-spooled with? How does the drag control work on the Daiwa Goldcast? The Daiwa Goldcast drag control works on a dial. Moving the dial left makes the drag looser, while moving the right to the right will tighten the drag. Is this reel primarily made of plastic or metal? Most of this reel is metal, including the handle. However, the knob to reel is plastic. What’s the difference in models? Between the GC 80, 100 and 120? The GC80 is rated for 8lb test line, while the GC100 is for 10lb test line and the GC120 is for 20lb line and up. How do you switch retrieval sides? Take out the screw into the handle, then move the handle to the opposite side and reinsert the screw. 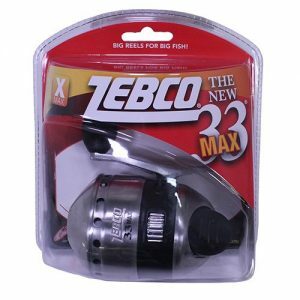 If you asked every fishermen alive today what the first fishing reel they ever used was, without a doubt most would answer with a Zebco 33. 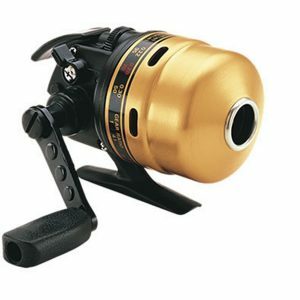 Termed as the most famous fishing reel in the world, the: Zebco 33 Authentic Spincast Reel lives up to its celebrity. This spincast Reel does not disappoint as it performs efficiently thanks to its unique and amazing features. It has a built in hook holder. The hook holder hides the hook point and is more favorable since it can be accessed from either side of the reel. This is convenience redefined. Moreover, it has a right of the left-hand retrieval system. Ambidextrous or not this reel is for everybody. Forget about the old features in usual reels; the Zebco 33 Authentic Spincast Reel comes with a new gear train that is faster and better. With this gear train, you get a smoother feel. It has a unique feature that makes it more durable as it retains the same smooth feel it had when you got it for the very first time. This new gear train incorporates a better bearing support system. The beauty of this is that you get to feel more as you reel in. If you hate the disturbing noise sounds that come with other spincast reels, then you have found your new fishing reel. This new gear train system is smooth and silent. All the way. This spincast reel comes with a micro fine drag that makes it all the more efficient. This micro fine drag feature functions to make sure you get no draw backs or breakage in your rod or line. You get your distances and angles just as you want them. What’s more, your adjustments are made very accurate and easy. 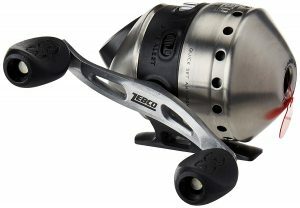 The Zebco 33 Authentic Spincast Reel has a light weight graphite frame. Since it is made of graphite, a light material, the whole spincast is very portable, and you need not struggle with it as you move around. Also, the handle is made of durable metal and has rubber stocks. As such, your grip is stronger, and the handle will last longer. This spincast reel has a 3.6:1 retrieve ratio making it relatively fast just as a perfect reel should be. It has a ball bearing drive that boosts its functionality and a good quick set anti-reverse system. This anti-reverse system is so good that it enables the line to play out as the handle remains in its initial position. Perhaps one of its unique features would be that it is spooled with 100-yards of 10-lb Cajun Line. The retrieval rate of this reel will work to your advantage when you are on the water. Also, the micro fine drag is modern enough to give the necessary resistance needed. It is light and easy to handle. Just like the brand brags, this spincast reel is arguably the most famous reel for a good reason. How well does this reel work with 8lb test fishing line? It works great and is the recommended fishing line size. If you need stronger line, braided fishing line works great as well. Is this a good reel for fishing in the ocean? What is the max line weight it will hold? It will hold up to 15lb test line, however it is not recommended for deep-sea fishing. It does work great for fishing intercostal waterways. How does this reel compare to a Zebco 404? This reel is the grade above the Zebco 404. Does the Zebco 33 have metal gears? Can this reel be used on a fishing rod made by another brand besides Zebco? Yes! It will fit any casting rod! Does this reel come equipped with stainless steel covers? Does this reel come prespooled with fishing line already? Yes! It comes with 10lb test premium Cajun line! Does this reel come with bite alert? Yes! It has a bite alert. The on/off switch is to the right of the drag wheel. When turned on, it also deactivates the anti-reverse. Allowing the line to be pulled freely from the reel. Be careful how you set it down, as the handle does turn backwards. 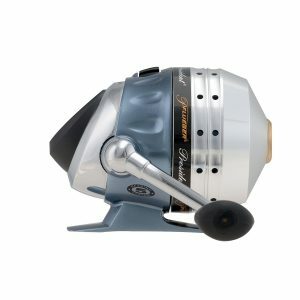 The Abu Garcia Abumatic 170 Spincast is covered with aluminum die cast that gives it a more appealing appearance and keeps the overall weight of the reel down. Such features also ensure that the reel withstands any wear that comes with time. Abu Garcia made it’s name with baitcasting fishing reels, but has since expanded into easy to use push button alternatives without the fear of backlash that many baitcasting reels suffer from. This particular reel has an added oscillating spool. Once your situated at the fishing hole, this reel is easy and accurate to use. You get to cast the distance you desire. With such ease, fishing gets more fun and less work. Less energy for better results. With it is also a no-twist line system that comes pre-spooled with 12lb. Berkley Trilene XL monofilament layer. In simple terms, the Abu Garcia Abumatic 170 Spincast comes with a line system so effective that it redefines fishing. Note that the line included is one of the best if not the best in the world not to mention the length that is given is far above the industry standard. This gives you an immediate starting point as soon as you buy this reel. No more searching or waiting. The drag on the 170 is boosted to an ultra-smooth carbon matrix drag system. This modern drag system is so good that it applies variable pressure to the line spool. As a result, the friction break applied is ideal and effective. The material used is strong enough to resist heat and any consequent forces ensuring your line does not break. With such an important feature, you can will be able to catch large fish without fear of breaking off. It’s smoother and durable long after your purchase and will become a staple in every fishing trip to come. Some of the advantages that come with this spincast innovation are that it can throw lighter lures further. This spin cast reel can cast good favorable distance. Second, this reel has a good anti-reverse system that provides sufficient strength against pull backs. Also, the oscillating spool gives it additional accuracy over other reels. May be the disadvantage that you’d experience with this spincast reel is its complexity. While it can be simple to use, to get the most out of this reel and call yourself a master could take a lifetime. Some like the fact the retrieval speed is slower than it’s counter parts, other’s want the fastest and best in the industry. This is the most up to date version of the Zebco 33 Max. It is an innovation with unique features that fishermen everywhere love. This spincast reel has had a modernized and unique facelift. This is ideal for the current generation that wants everything to look good. If you are a parent trying to get your child fishing, then this spincast reel is a perfect choice. This reel has an all metal body. Which gives it a very strong structure that will not wear down with time. The metal used is good enough to withstand wear and tear for generations to come. To make it easy to carry, it is made of a graphite frame. The graphite frame also protects the whole body, in general, all the while giving the newest Zebco model a really cool look. With a built in bite alert, this spincast reel comes with many advantages. Once a fish bites on your live bait, the built in bite alert triggers so you can begin the fight. With this feature, more time is saved, and there is no risk that your baited fish will escape. The Zebco 33Max comes pre-spooled with a 20-pound line. Once purchased it can be used immediately and makes a great backup reel to have in your tackle box. Its efficiency is further enhanced by a modern ball bearing drive. With this feature, fishing is taken to the next level. The innovations done on this spin cast technology is new and ideal for a modern spin casting reel. The re-engineered features give it a smoother and better feel while maximizing its performance. Upsides to this spin cast innovation aren’t just the appealing look it has. It resonates well with most modern and young fishermen who fish for recreational purposes. It has a strong structure giving it a durable advantage. The bite alert serves well to save time and the trouble of guessing whether the fish has taken your bait. The frame makes it light to carry. Drawbacks to this reel is the retrieval speed. It isn’t as fast as some of the reels on our list, but Zebco has been the forerunner in the spincast reel market for generations and will be here for generations to come. Pfluger has been manufacturing fishing tackle since 1881, making it the oldest company on our list of best spincast fishing reel companies. The best in their line is the Pfluger President, known best for being a backpack reel. It comes equipped with 4 ball bearings, as well as an instant anti-reverse bearing. It’s built with a tough aluminum frame. The frontal cone is ported and machined to perfection. The aluminum handle has a soft touch plastic rubber knob. The reel weighs a measily 12.8ounces and fits in most jean pockets. This is a great reel to buy and keep as a backup for any occasion. Or when your going somewhere and aren’t sure if there is going to be solid fishing. What’s the difference between the 6 and 10 models in this series of reels by Pflueger? The difference is the 6 is a lighter model and the gear ratio is slightly lower from the 10. However, there are no differences in the appearance/look of the reel. Additionally, the 6 comes pre-spooled with 6lb monofilament fishing line, while the 10 comes pre-spooled with 10lb fishing line. The 6 has a 3.4:1 gear ratio, and a retrieval rate of 14.5”. It also weighs 8.6 ounces, while the 10 comes pre-spooled with 10lb monofilament fishing line and a gear ratio of 3.8:1 with a retrieval rate of 18.5” and weighs 11.2 ounces. What size fishing line is recommended for use with the Pflueger President? 8 to 10lb test has been proven to work the best. This reel doesn’t work well with braided fishing line either. Is the thumb lever made of plastic or metal? Plastic, it has been shown to break for some users. Are the pins a big problem? Only when using braided fishing line are the pins a problem. Braided line cuts into the face of the reel and saws into the pins. The second daiwa to make our list, the Daiwa Minicast Size 40 is another fantastic spincast reel. It’s built with an aluminum alloy body and nose cone. The smooth disk drag feature is the smoothest on our list. The simple push-button casting allows you to cast further with less pressure. It comes pre-spooled with 4lb test line, and makes a great addition to any ultra-light fishing experience. The power handle is built of the same durable alloy the rest of the reel is, but it does come equipped with a plastic and rubber grip for those rainy days. The reel handle won’t slip out of your hands as your reeling in supper. This is a smaller model than our previous Daiwa, and works great when fishing for panfish like Crappie, bluegill, or smaller trout. Threading this reel can be a little different than most spincasting fishing reels. You’ll want to unscrew the cover and tie on the line with a simple backwards square knot. Then place the cover back on, thread the line through your fingers and reel until it’s full. What kind of fishing line works best? Typically 6lb – 30lb works fine, however for the best possible performance try and stay somewhere in the middle. Does braided fishing line work well with Spincast Reels? Yes! Like most spincast reels, 10-12lb braid works best. Do the spincast reels come with a warranty? Yes, most come with warranties although they vary depending on the manufacturer and your place of purchase. Can I get replacement parts for my spincast reel? Yes you can. You can get these online depending on your spincast brand, contacting a manufacturer has never been easier than it is today. What do I do if my spincast reel breaks? Contact the manufacturer while the reel is still under warranty. Are all spincast parts the same? Unfortunately, no, different manufacturers have different parts for their products. While they may look similar in size at times, it is not safe to insert parts of one reel from another that aren’t a similar brand. If you do so, you do so at your own risk.